The Garden of Surging Waves, the city of Astoria's bicentennial legacy gift, will help share an important piece of Astoria's history and marks the 200th anniversary of the city's founding (1811-2011). The Astoria Column, that also reveals pieces of Astoria's past, was the city's centennial legacy gift, celebrating its 100-year anniversary. The garden will serve as a reminder not only of Chinese contributions to Astoria and the Pacific Northwest, but to Oregon's early ties to China that were first developed in the days of John Jacob Astor, and have flourished over the last 200 years. 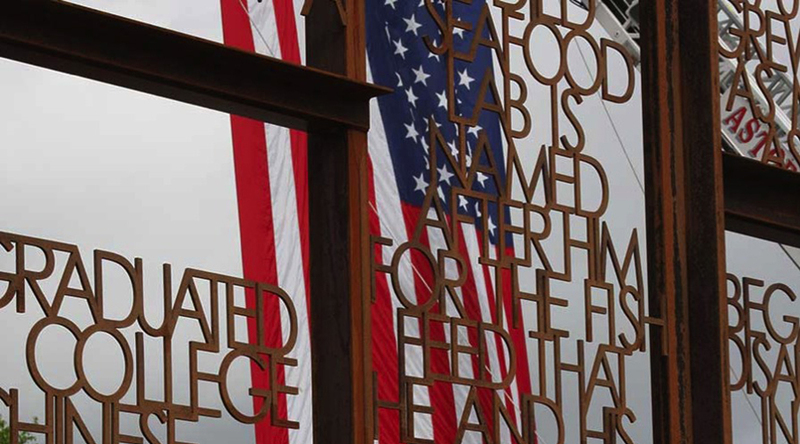 Astoria, Oregon has a rich history reflecting the influence of cultures from around the world. Many of its current residents are decsended from the early families that built the city and provided labor for its first industries. The Chinese played a significant role in the history of Astoria, working in the canneries, building the city's sewer system, constructing railroads that would connect Astoria to Portland, and building the jetties at the mouth of the mighty Columbia River. The Garden of Surging Waves is a city park designed to honor and celebrate the Chinese heritage of Astoria and the Lower Columbia River Basin. The park occupies a portion of a city block that is bordered by 11th Street to the west, Duane Street to the north, 12th Street to the east, and Exchange Street to the South, in the core of Astoria's historic downtown district. It is situated directly across from Astoria's City Hall. 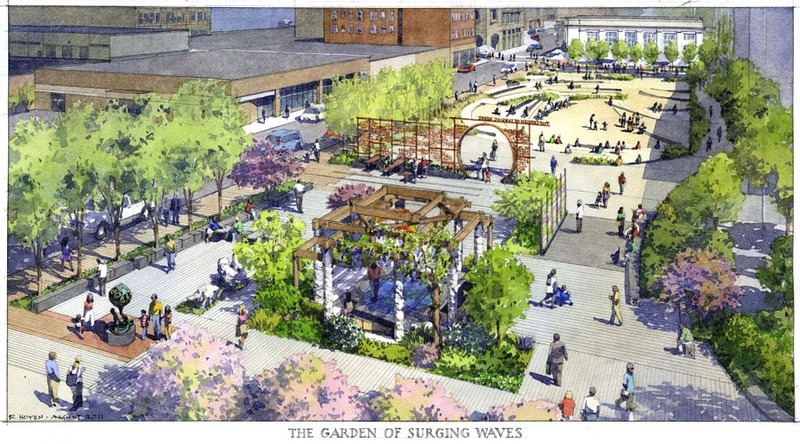 The Garden of Surging Waves is one piece of a larger redevelopment project slated for this city block, now referred to as Heritage Square. 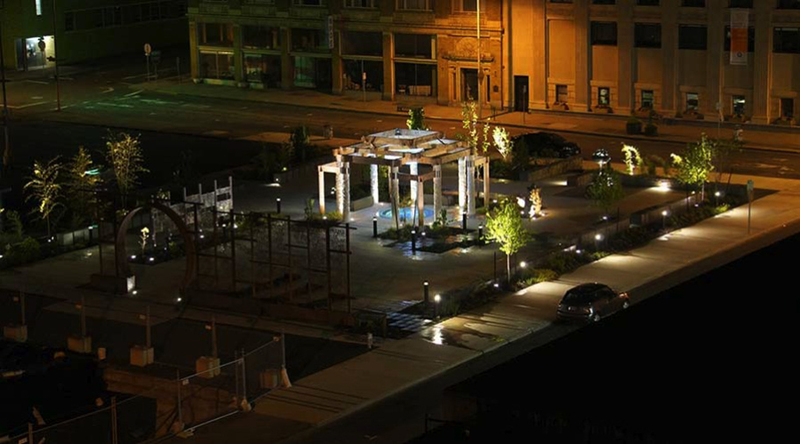 The Garden is Phase I of the Heritage Square project. Development of additional public space is envisioned for other parts of the block in future phases. Initial concepts suggest an amphitheater and large, open areas designed to serve as community gathering spaces (see upper portion of rendering above). 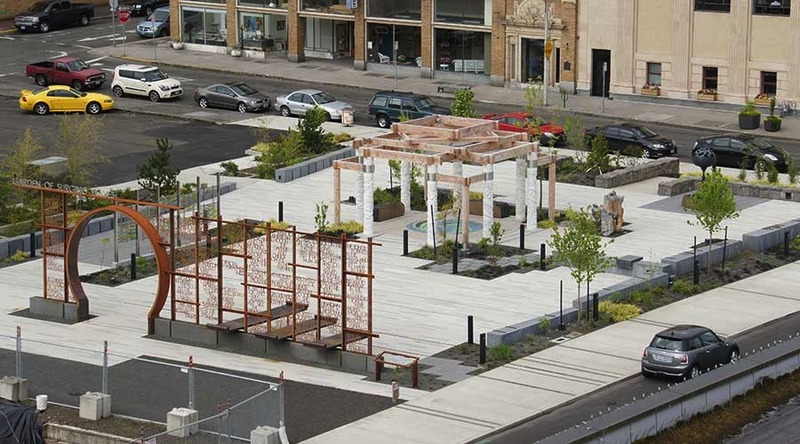 The block could accommodate multiple uses, whether showcasing community events, offering a stage for outdoor performances, or providing family and friends an enjoyable urban park setting in the heart of downtown Astoria. There is currently no space in the city's downtown core that is developed to serve such purposes on a permanent basis. The Garden of Surging Waves is pronounced “Cāng Láng Yuán” in Chinese. Listen for the Chinese pronunciation (click the speaker icon in the page that opens). The Chinese written characters for the words “surging wave” are also used to express hardship and struggle — experiences shared by many of America's early immigrant groups.